Peter Doran, Owen Thomas and Gareth John Bale have taken theatre to new places, places in recent years that no others have reached. The three names are not placed in any order of pre-eminence. It could equally have been Thomas-Bale-Doran; without the author there is not anything else. But then it is the actor who does the most work so Bale-Thomas-Doran is just as good. And it was Bale who lit the spark. “I'm hoping to do a show about Ray Gravell” he said. That was back in 2011. Many others have helped “Grav” go from tour to tour, to Edinburgh, to a television documentary and to cross the Atlantic. The sound design is crucial. The technical team for the latest tour comprises Andrew Sturley, Jerome Davies, Simon Evans and Alex Davies. So too the set- the original by Frankie Bradshaw- is essential in grounding the performance. It is recreated in London by Sam Wordsworth and Joe Jones. Phoebe Tonkin and Louise Worrall are the scenic artists. The reviews have been done. Seeing it four years on, the review of 17th March 2015 below feels right. But it underscores the emotional range, the ascent to sheer exultation, the intricacy of Owen Thomas' structuring, the richness of detail. This detail has the player of four hundred-plus games bemused that the mud is taken from his encrusted boots for a souvenir. When he meets the hospital consultant who resembles John Goodman, fresh in the memory as Fred Flintstone, it is entirely good sense that he be greeted with “yabba dabba doo”. “Grav” has been not just to theatres but to churches and schools. It has played Mynyddygarreg and the original Rugby in England. 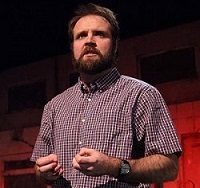 But it also had a performance on 18th February this year that Owen Thomas described as the proudest night of his playwriting career. It took place at the Principality Stadium to an audience that included Warren Gatland, Alun Wyn Jones, Shaun Edwards, Neil Jenkins, Robin McBride, Leigh Halfpenny, Gareth Davies, George North and Ken Owens. The emotional impact was profound, the performance inducing tears among the watchers.